The company plans to use the money to scale its operations in the US and continue to roll out services in the UK. This morning Healthy.io, maker of a take home urine analysis test kit, announced a new $18 million Series B funding round. The funding round was led by Aleph, with participation from Samsung Next and private investors. 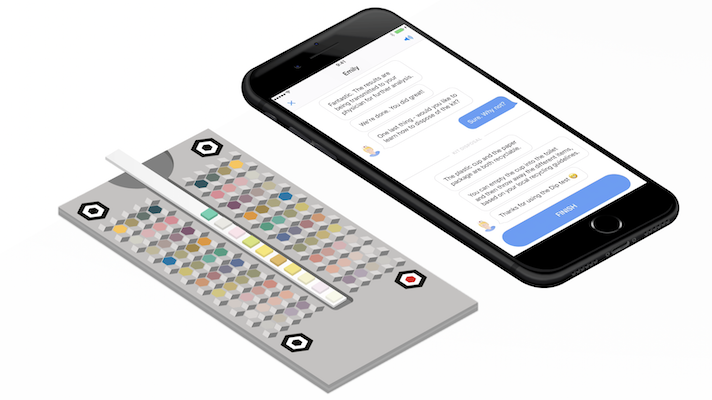 The Tel Aviv, Israel-based company’s signature product is Dip.io, a home-based urinalysis kit that turns a smartphone into a clinical-grade diagnostic device. The kit includes a disposable test strip and testing cups — as well as detailed instructions for users. Once the patient has dipped their test stick into the urine sample, they can slide it into a board with various patterns and colors. The smartphone camera can read these colors and patterns accurately read the test strip in various environment. Patients can get the results shortly after testing. The system landed FDA 510(k) clearance in July and has already been commercialized in Europe and Israel. The system can be employed for a number of use cases, including for patients with chronic kidney disease early detection, testing for a urinary tract infection, and streamlining prenatal care. The new money will be used to help scale operations in the US and continue roll out of services in the UK. While Healthy.io may have been one of fist smartphone-connected home urine testing products to land FDA clearance, Scanwell, and inui Health have also gotten the green light from the agency. When inui Health landed clearance in September it bragged that it had more tests than most of its competitors. Its tests include protein, glucose, leukocyte, nitrite and ketone. "Instead of spending money and other resources to get people to come to the lab, we offer providers a full home-based service. With our 'pay per protein' model, we only get paid based on tangible cost improvements we deliver by detecting elevated protein in urine – which identifies previously undetected Chronic Kidney Disease,” Yonatan Adiri, Healthy.io founder and CEO, said in a statement.